A primate skull has been discovered in the Caribbean that looks like nothing ever seen before. Except a monkey from 16 million years ago. Why was such an ancient species roaming the Caribbean just a few thousand years ago? The monkey skull was discovered on the island of Hispaniola, which is comprised of Haiti and the Dominican Republic. It's the first well-preserved skull ever found on the island, and it shows clear links to modern monkeys found in Central and South America. Even so, despite its young age – it's only a few thousand years old – its brain case is incredibly unusual, and the closest resemblance can be found in a species of Argentinean monkey that died out some 16 million years ago. This extreme primitiveness is a known feature of primates found in isolate island environments, with perhaps the most spectacular example of this being the lemurs of Madagascar. Lemurs have helped us understand what its ancient cousins on the African continent would have looked like, and the hope is that further study of this relatively recent Hispaniola monkey can shed similar light on the South and Central American monkeys from millions of years ago. 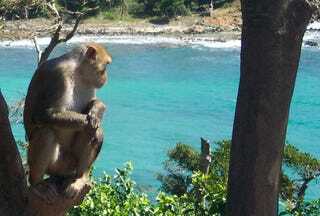 Such unusual features is nothing new for the extinct monkeys of the Caribbean. The Jamaican monkey Xenothrix is a lot like the Madagascan Aye-aye, which both have rat-like incisors and a long finger used to extract insects from bark. The arms and legs of the Cuban monkey Paralouatta indicate the animal spent part of its life on the ground instead of in the forest canopy. That behavior is found in no other New World monkeys. This new monkey skull overturns existing theories that a single monkey species accidentally came to the Caribbean and gave rise to all subsequent species on the islands. This new skull is so different from even those previously observed that it would have to come from a different monkey species entirely, which complicates the picture of how monkeys got to the Caribbean in the first place. Indeed, it once seemed so unlikely that monkeys could have even reached the Caribbean that paleontologists didn't generally accept their existence there until 1952, when irrefutable evidence emerged. There appears to be some geological evidence to support the existence of a land bridge, dubbed Gaarlandia, that would have linked the region with the rest of the Americas some 33 to 35 million years ago.